Every year, colleges give out billions of dollars in scholarships, most of which is awarded at the very end of a student's high school career. Research suggests this timing is often too late to have an impact on students’ college aspirations, application decisions and postsecondary outcomes. Raise.me flips the script on scholarships, turning them from a reward into an incentive by allowing students, starting as early as ninth grade, to earn scholarship dollars from colleges for individual progress and achievement, whether that’s getting a good grade, volunteering in the community or joining extracurriculars. Raise.me is an innovative program supported by the Gates Foundation that helps students accrue grant aid from more than 150 partner colleges including Northeastern, Colby, Penn State, Michigan State, Georgia Tech and Tulane. The micro-scholarships offered on Raise.me promote college readiness and play a positive role in students' development. Thousands of educators at more than 17,000 high schools use the program as a tool to motivate students and build college-going culture. Download accompanying handouts. Discuss ways to increase student motivation and approaches to shift the paradigm of financial aid literacy for students, high school educators and colleges. Explain how shortening the feedback loop, increasing transparency and engaging earlier with students about financial aid positively influences college preparedness and student success. 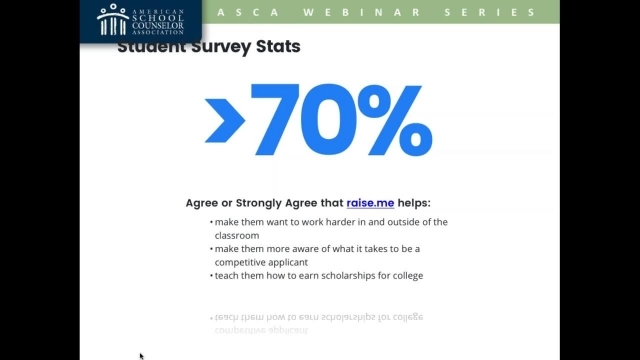 Utilize a free tool that motivates students earlier in high school and helps them keep track of scholarship opportunities and earnings, resulting in higher-performing students and increases in college-going culture within their student network. Amanda Schwab is director of district and community partnerships for Raise.me.